(Reuters) – Stocks slipped in low volume on Monday as traders awaited Tuesday’s U.S. election to place bets on sectors seen performing better under one or the other political party. 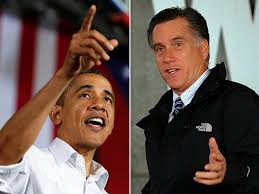 Democratic President Barack Obama and his challenger, Republican Mitt Romney, sprinted through key states on the last day of the race for the White House. Investors also eyed Congressional races to gauge how the United States will deal with the $600 billion in spending cuts and tax hikes that could kick in next year and send the economy reeling. “People are pausing ahead of the election and what that means for the fiscal cliff,” said Jim Paulsen, chief investment officer at Wells Capital Management in Minneapolis. Leading world economies pressed the United States on Sunday to act decisively to avert the fiscal cliff, calling it the biggest short-term threat to global growth. The market didn’t much react to data showing the pace of growth in the U.S. services sector slowed modestly in October as new orders slipped, though employment improved. Paulsen said economic data could soon be started to get affected by super storm Sandy and its effect on economies along the U.S. northeast. A week after Sandy wreaked havoc on New York City and the surrounding area, close to 2 million people still have no power as cold weather sets in. On Sunday 30,000 to 40,000 people in New York City were in need of shelter. The Dow Jones industrial average finance/markets/index?symbol=us%21dji”>.DJI fell 47 points, or 0.36 percent, to 13,046.16. The S&P 500 .SPX dropped 5.43 points, or 0.38 percent, at 1,408.77. The Nasdaq Composite .IXIC was down 2.82 points, or 0.09 percent, at 2,979.31. Transocean Ltd (RIG.N)(RIGN.VX) reported a higher-than-expected adjusted profit for the third quarter and its shares were up 5.4 percent at $48.55. A private survey of China’s growing services sector slipped in October, with weaker-than-expected new orders injecting a note of caution after three previous PMI surveys for October showed the world’s second-largest economy regaining momentum. Greece’s government will present a new austerity package to parliament on Monday, facing a week of strikes and protests over proposals which must win deputies’ approval if the country is to secure more aid and stave off bankruptcy.